There are many reasons to join the social media bandwagon and this study gives measurable results to how social media has benefits to businesses. The Social Media Examiner conducted a study that surveyed a cross section of businesses using social media as part of their marketing mix. 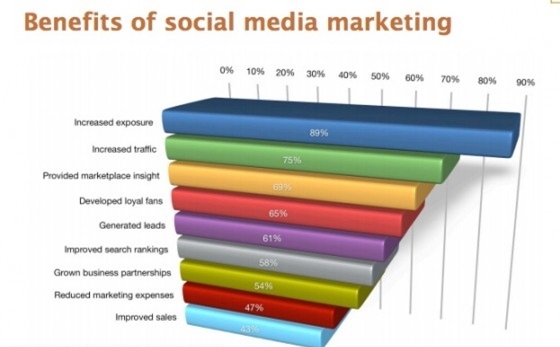 They found 9 key benefits of social media marketing. Build your brand recognition! Share your content across multiple social media platforms and remember it’s not a one-way conversation. If a customer posts a comment or question always respond…no matter what. To increase the traffic to your website be sure to post your social sharing on your blog and website. Traffic is extremely important to any site and social media will help drive traffic to the webpage. To increase it further have guest blog writers or show your product off on Pinterest with great visuals! Listen to your customers and find out exactly what they are thinking and what they want from your products. Understand what your competitors are doing better then you and nudge customers to rate and review your products. Loyal fans improve post-purchase revenues. Spotlight your customers and provide perks for the most loyal of fans to make them feel special. As a form of marketing, social media can help attract and qualify prospects. Answer customer questions, explain how to use your product, or educate your market. These are all great ways to attract more leads and customers into your market. Social media platforms provide another way to appear in search engines—increasing your chance to be seen on the first page of results. Optimize your social media pages with specific keywords and include your business information so that they can find you. Social media allows you to extend your company in so many ways. This is extremely powerful, especially for small businesses. Reconnect with colleagues and friends and take social media offline by meeting your connections in real life. Build relationships with your customers and put in the effort of nurturing specific relationship behind the computer screen. Don’t confuse social media as a free service, it costs money, but in a less expensive and more effective way. You can reach more people and target specific groups in less expensive forms of distribution and communication. Incorporating a social media call to action will encourage your connections to take action, allowing your business to track specifically where the business originated. Create a sale of the day tweet or provide recipes and patterns to link to your product pages. Follow SM Sold on Twitter for the latest real estate news and advice.